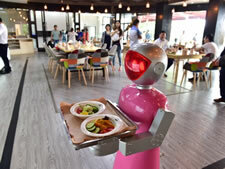 By Jed Kolko for Five Thirty Eight: More and more work activities and even entire jobs are at risk of beingautomated by algorithms, computers and robots, raising concerns that more and more humans will be put out of work. The fear of automation is widespread — President Obama cited it as the No. 1 reason Americans feel anxious about the economy in his State of the Union address last month — but its effects are not equally distributed, creating challenges for workers and policymakers. An analysis of where jobs are most likely to face automation shows that areas that voted Republican in the last presidential election are more at risk, suggesting that automation could become a partisan issue.